Donald Trump was inaugurated as the 45th President of the United States on January 20, 2017. Supporters of Israel uncomfortable with Trump’s lack of political and, especially, foreign policy experience, looked to his son-in-law Jared Kushner for reassurance. Trump’s daughter Ivanka had converted to Orthodox Judaism to marry Kushner and he was viewed as one of the new president’s closest advisers. Kushner has a personal relationship with Netanyahu going back many years. He reportedly wrote the very pro-Israel speech Trump delivered at the AIPAC Policy Conference in 2016 and was expected to be a positive influence on the president’s policy toward Israel. Trump also chose two close friends, neither of whom had any foreign policy experience, to work directly with Israel. The first, David Friedman, a 57-year-old bankruptcy attorney was appointed ambassador to Israel. Friedman aroused controversy because of his role as the president of the Friends of Bet El, a settlement in the West Bank. Friedman also was an outspoken critic of the two-state solution and had angered some Jewish leaders when he referred to J Street as being worse than kapos and made derogatory remarks about the ADL. Friedman was confirmed after testifying before Congress that he would support the pursuit of a two-state solution and apologizing for the comments he had made about J Street. After Trump recognized Jerusalem as Israel’s capital, he became the first U.S. ambassador to make an official visit to the Western Wall. Trump’s other surprising appointment was Jason Greenblatt, the executive vice president and chief legal officer to The Trump Organization, as Special Representative for International Negotiations. Greenblatt traveled to Israel and the West Bank in March 2017 and impressed many of his interlocutors with his open-mindedness. He spoke to Jews and Arabs with a variety of opinions, including Israeli settlers and Palestinian refugees, and presented the image of someone who would be a skilled negotiator. Palestinian President Mahmoud Abbas said after meeting the envoy he believed Trump was serious about reaching an agreement. Arab leaders who met with him on the sidelines of the Arab League summit in Jordan a few weeks later came away with the same opinion. While the president repeatedly expressed his commitment to Israel and his intention to take a friendlier approach toward Israel and its prime minister – statements that alarmed the Palestinians -- some of Israel’s supporters were concerned when Trump chose Exxon executive Rex Tillerson as secretary of state. Yet another appointee with no foreign policy experience, Tillerson had extensive ties in the Middle East due to his position in the oil industry, but, given that industry’s traditional closeness to the anti-Israel oil-producers of the region, his views on Israel were uncertain. Early on, however, he sought to reassure Israel and its friends, stating during his confirmation hearings, for example, “Israel is, has always been and remains our most important ally in the region.” He criticized Security Council Resolution 2334 and his predecessor’s “troubling” speech condemning Israeli policy. “The president-elect has already made it clear that we're going to meet our obligations to Israel as the most important ally in the region.” He also expressed skepticism about negotiations with the Palestinians so long as they refuse to recognize Israel as Jewish state and cease terrorism. Tillerson also vowed support for congressional action to combat the BDS movement and a full review of the Iran nuclear deal, which he opposed. In mid-June 2018, Greenblatt and Kushner travelled to the Middle East to test the waters for a potential Israeli-Palestinian peace plan and explore options for rehabilitating Gaza. Greenblatt and Kushner met with officials in Jordan and Israel to discuss these topics, but Palestinian leaders refused to meet with the U.S. delegation. Two days after his inauguaration Trump had called Israeli Prime Minister Benjamin Netanyahu to discuss the Iran nuclear issue as well as the regional threat of ISIS. Trump invited the Prime Minister to visit the White House, which he did on February 15, 2017. During a joint press conference with the Prime Minister, the President dropped the historic U.S. commitment to a two-state solution to the Israeli-Palestinian conflict, stating I'm looking at two states and one state, and... I can live with either one. Appearing to startle the Israeli leader, Trump later suggested that he would like to see [the Israelis] hold back on settlements for a little bit. Trump also surprised Netanyahu by publicly urging the prime minister to “hold back on settlements for a little bit.” Prior to their meeting, the White House had told Israel to stop announcing new settlements. Press secretary Scott Spicer said, “While we don’t believe the existence of settlements is an impediment to peace, the construction of new settlements or the expansion of existing settlements beyond their current borders may not be helpful in achieving that goal.” To read a full transcript of the joint press conference, please click here. On May 3, 2017, President Trump hosted Palestinian Authority President Mahmoud Abbas in the White House. The Washington Post reported on May 15, 2017, that five days earlier Trump had revealed highly classified information in a White House meeting to Russian Foreign Minister Sergei Lavrov and Russian Ambassador to the U.S. Sergey Kislyak. It was subsequently revealed that the information had been obtained by an Israeli source embedded within ISIS in Syria. Israeli officials feared that the leak could compromise intelligence sources and put Israeli agents in danger. The administration also declared National Jewish American Heritage Month in May 2017. President Donald Trump embarked on his first foreign trip as President on May 19, 2017, with plans to visit Saudi Arabia, Israel, the Vatican, and then various European nations on a 9-day trip. On May 21, 2017, Trump arrived in Israel on the first ever direct flight from Riyadh, Saudi Arabia to Tel Aviv, and was greeted by a red-carpet ceremony at Ben-Gurion International Airport. After issuing joint statements with Israeli Prime Minister Netanyahu, Trump met with Israeli President Reuven Rivlin and then toured Jerusalem’s Old City with his entourage. 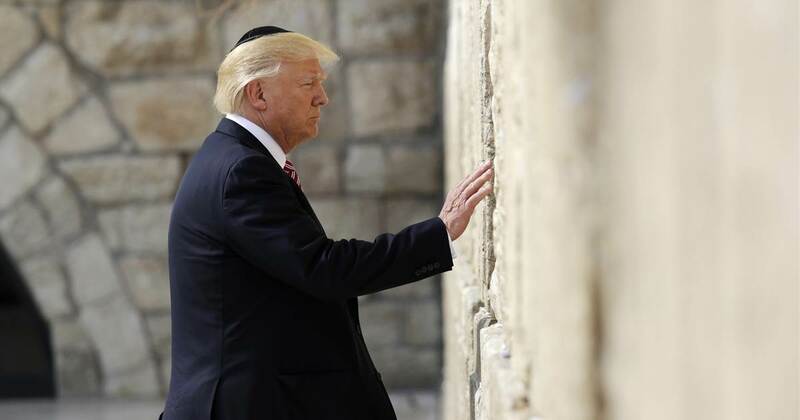 President Trump wore a Yarmulke and prayed at the Western Wall during the afternoon of May 21, 2017, becoming the first sitting President to ever visit the holy site. During Trump’s visit to Israel he also took time to meet with Palestinian Authority President Mahmoud Abbas in Bethlehem. While initial reports surfaced of a cordial meeting, this was soon disproven by officials with knowledge of the exchange. Trump reportedly screamed at Abbas, saying he had deceived me [Trump] in Washington, after being shown by the Israelis that Abbas personally ha[s] a hand in incitement. In a meeting with Palestinian officials on June 20, 2017, Trump’s envoy Jason Greenblatt reiterated the demand that the Palestinians cease payments to the so-called Martyr’s Fund. A Palestinian official said the meeting did not go well and the request was rejected. Reportedly, the PA increased payments to terrorists and their families in 2018 by nearly $56 million after distributing $347 million in 2017. In 2018, Trump signed into law the Taylor Force Act, which halted U.S. foreign aid to the Palestinian Authority until Palestinian terrorists and their families cease to be paid. Israeli Prime Minister Benjamin Netanyahu was the first person President Trump met one-on-one with during the United Nations General Assembly in September 2017. Later that month, Trump’s Ambassador to Israel, David Friedman, sparked angry reactions from around the globe when he broke with formal U.S. policy and stated that the settlements are a part of Israel. The U.S. State Department clarified that Friedman’s statements did not indicate a shift in policy and should not be used to prejudge negotiations to come. After weeks of internal debate as to whether to eliminate all UNRWA funding as punishment for opposition to President Trump’s policies, the Trump Administration decided on January 16, 2018, that the U.S. would pledge $60 million to Palestinian refugee programs. This is slightly less than half of what was expected, and according to administration officials the remaining $65 million would be held for future consideration. The following week the U.S. State Department announced that they would be withholding an additional $45 million in food aid pledged the previous month in a separate agreement. On December 6, 2017, President Trump announced the official U.S. recognition of Jerusalem as Israel’s capital, and the beginning of the process of moving the U.S. embassy in Israel from Tel Aviv to Jerusalem. The decision was widely criticized by leaders around the globe as detrimental to the peace process. Every other member of the United Nations Security Council voted in favor of a draft resolution reversing Trump’s decision two weeks later on December 18, but the resolution was vetoed by the United States. The General Assembly subsequently voted overwhelmingly on December 19, 2017, for a resolution implicitly calling on the U.S. to withdraw its recognition of Jerusalem. Vice President Mike Pence made at two-day visit to Israel in January 2018. Palestinian officials refused to meet with him in protest of the decision on Jerusalem, but he was warmly greeted by Israelis. During the trip, Pence announced the U.S. embassy would be moved to Jerusalem before the end of the year, contradicting earlier State Department statements suggesting the move would be delayed for years until a new building could be constructed. Soon after, the administration announced that it would move the U.S. embassy to the grounds of the consulate in Jerusalem on May 14, 2018, to coincide with the celebration of Israel’s 70th birthday. The new United States embassy in Jerusalem was opened on May 14, 2018, coinciding with Israel’s independence day. Officials from the Trump administration attended the ceremony, along with representatives from 33 other countries. Noticeably absent were representatives from Western European nations. Trump also announced the U.S. would reimpose sanctions lifted as part of the JCPOA and that “no new contracts” with Iran will be permitted. The U.S. Treasury Department said it would halt transactions in Iranian government debt or currency, and purchases involving the country’s automobile sector within 90 days. Deals involving Iran’s oil and energy sector, shipping and ports, would be banned within 180 days. Individuals and entities that were delisted from sanctions will be re-designated. The decision to withdraw from the deal was met with widespread criticism from many foreign policy experts, former Obama administration officials and some nuclear proliferation analysts. A poll published by Politico also indicated the American public was split on the decision (40-37 percent opposed pulling out in response to one question but, when worded differently, respondents approved by a 42-40 percent margin) and most felt it made both the United States and Israel less safe. Meanwhile, America’s Middle Eastern allies expressed enthusiastic support for the U.S. announcement. Israel, Saudi Arabia, Egypt, the UAE, and Bahrain all pointed out the flaws in the agreement and hailed Trump’s decision. Trump also sent a message to Tehran when he ordered air strikes in April 2017 and 2018 against targets in Syria which President Bashar Assad had used to launch chemical weapons attacks. By demonstrating that he was willing to use military force when red lines were crossed, Trump put the Iranians on notice that they could not count on using the nuclear agreement as a shield against an American response to their provocations. The Trump Administration released a National Security Strategy paper on December 18, 2017, featuring a section detailing the administration's regional Middle East Strategy. Israeli Prime Minister Benjamin Netanyahu met with President Trump on March 5, 2018. Netanyahu thanked the president for his support, and specifically the recognition of Jerusalem, but the main focus of their meeting was mutual concerns about Iran. On March 13, 2018, the U.S. hosted a conference with the goal of addressing the humanitarian crisis in the Gaza Strip. Enraged by President Trump’s decision to unilaterally recognize Jerusalem as the capital of Israel, the Palestinians rejected an invitation to the conference, which was attended by representatives from 19 nations, including Israel and all of the Arab Gulf states. On March 25, 2019, Trump announced the United States would recognize Israeli sovereignty over the Golan Heights. Some observers believed the timing of the announcement was meant to help Netanyahu’s reelection campaign. A subsequent visit by Pompeo days before the election reinforced this perception as did the administraiton's silence following Netanyahu’s campaign remark about annexing the settlements and its decision to designate Iran’s Islamic Revolutionary Guard Corps as a foreign terrorist organization. Adam Taylor, “What Trump did to push the Israeli election in Netanyahu’s favor — and what he didn’t do,” Washington Post, (April 9, 2019).